I’m sitting here watching the horror/comedy short film titled Treevenge, and about halfway through I’m thinking, there’s something familiar about all this. 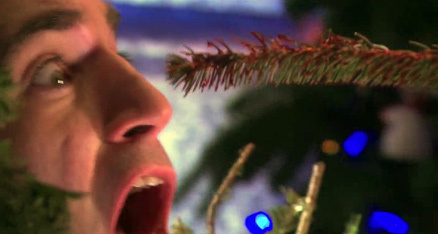 It’s the over-exaggerated human behavior – in this case, Christmastime exploitation of evergreen trees turned into some kind of torture session run by mad humans. The lumberjacks cut, chop, and chainsaw down helpless trees with a look of madness in their eyes as they shout obscenities like some crazy bum in the street. 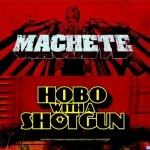 Jason Eisener’s short film Hobo With a Shotgun won the South by Southwest Robert Rodriguez Grindhouse Trailer Competition back in 2007. As a result, the film was transferred to 35mm and attached to Canadian prints of Quentin Tarantino and Robert Rodriguez’s film. When the trailer hit the Internet, people all over the world were talking about the note-perfect homage to the grimmiest exploitation films. 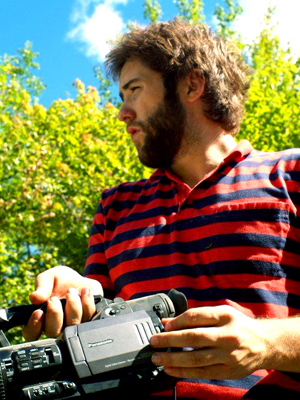 Eisener’s latest short Treevenge premiered at the 2008 Fantasia Film Festival where it won both the audience award and best short film. Treevenge is now playing at Fantastic Fest as part of the shorts program. Every year at Christmas it’s tradition at home for my family to get together and decorate the Christmas tree. I think it was 2 years ago I went home for Christmas and while we were decorating the tree, I started thinking how awful this must be from the perspective of the tree: to be cut down, taken from their quiet home in the woods, bagged, sold, then brought into strange houses where they are screwed into place, and decorated with bulbs and lights. For a tree, that experience would be so horrifying. Treevenge has several composers, and I decided to use more than one because I really wanted some scenes to have their own sound. A lot of people will recognize the opening theme to the movie, which is from Cannibal Holocaust . I came across this band on Myspace called Morte Macabre who did their own version of the song and it sounded amazing. They were happy to let us use it. Can you believe the ending? He actually went there! In the interview Eisener suggests the tree voices were inspired by Gremlins… I personally thought they sounded like Ewoks! Some other possible influences I thought about was, of course, The Evil Dead, and also the very funny short film, Staplerfahrer Klaus. And as for Hobo With A Shotgun… well, that was a great faux-trailer that never made it to the American release of Grindhouse, but after seeing it online, I thought it would make a great candidate for a real movie (instead of Machete, as it turns out). Well, guess what? They’re making a real movie out of it! What is the status of the full-length Hobo With a Shotgun film? Things are looking great. We have an executive producer from Toronto on board who is helping us get our financing together for the project. His name is Niv Fichman and he just produced Blindness and Passchendaele. 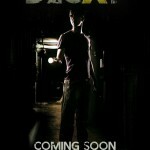 So, hopefully you’ll hear about us kicking it into production in 2009. Here’s an interview (mp3, zipped). Read our review of Hobo With A Shotgun.